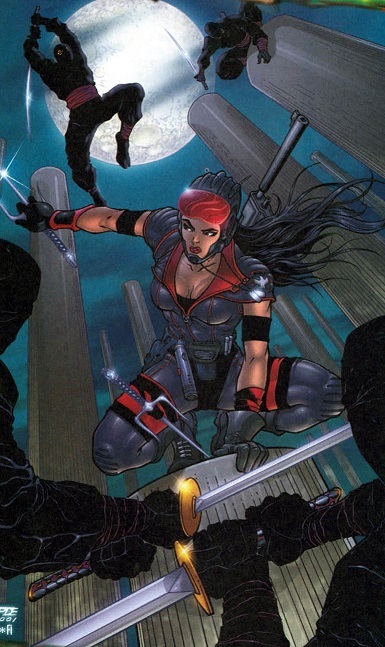 Powers/Abilities: Elektra was a cyborg equipped with the skills of an experienced assassin. History: (Marvel Knights Millennial Visions 2001 - "Death on Two Legs" (fb) - BTS) - Several years ago, a Greek industrialist designed the robot Elektra-Class NinjaBot program for special European missions, a program that took the comatose bodies of teenage girls and outfitted them with bio-tech computers to transform them into the perfect assassins. When the E1 prototype went buggy, the program should have been terminated but the industrialist instead took the still-living body of an antisocial Goth teenager who had attempted suicide on her prom date and transformed into Elektra-Class NinjaBot E4. For E4's first mission, she was to assassinate Victor von Doom despite not having tested her well and the program not being sure how she would respond under stress. During the mission, orders came in to abort the mission but E4 went rogue and assassinated von Doom anyway. (Marvel Knights Millennial Visions 2001 - "Death on Two Legs") - When calls from Washington began coming in, General Fury recognized that the cover story that jamming devices had prevented E4 from receiving the abort orders was false and knew what had to be done. As Elektra remained in Doom's castle, Fury planned a retrieval operation that would get Elektra out of the castle, where Fury planned to later destroy her CPU even if he had to send a new NinjaBot after her. Thinking how the next Elektra-Class NinjaBot would need a fail-safe, Fury prepared for a long night as the phone calls continued coming up by popping a few antacids. Comments: Created by Buddy Scalera, Ryan Bodenheim and Scott Elmer. Elektra's height & weight were impossible to determine, as she was a different character than her Earth-616 counterpart and was not seen next to anyone whose height & weight had been officially determined.